and things I could not touch. these things are now gone. my memories hold so dear. I heard its tocks and ticks. it’s still a beacon call. and behold its pristine face. by the mainspring’s constant whir. when their owner finally dies. A live version of the Low Anthem’s song “To Ohio” from last year’s CD, “Oh My God Charlie Darwin.” It just missed making my top ten for 2009, but that doesn’t mean I don’t love their music. Well worth the listen if you like something soft and acoustic. Christmas now looms large on the horizon, what with Black Friday, and Cyber Monday on today’s agenda. I thought I’d throw out a few interesting facts about how we celebrate this holiday. St. Nick of old European legend was said to be accompanied not by elves like our modern version of Santa Claus, but by an impish little devil creature named “Krampus” who punished and kidnapped naughty children. If kids were bad, Krampus would leave them bad gifts. That’s where the idea of giving people coal for Christmas first probably originated. The custom of gift giving may not connect so much to the gifts of the Magi, as to an old Roman winter celebration. The winter solstice, which coincides with Christmas, was the only time of the year when the rich would give their slaves gifts of food and the like. 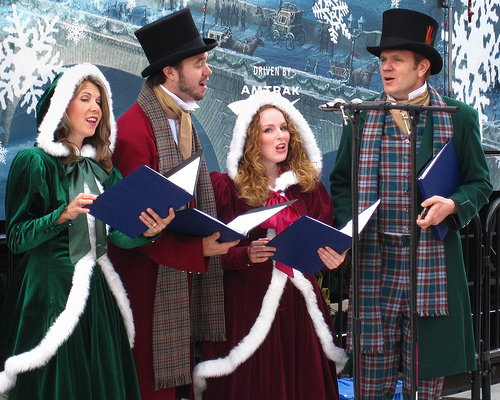 The origin of caroling dates back to the pagan celebration of the winter solstice, when Christmas was regarded as a festival of pure joy and drunken revelry. Groups of poor medieval carolers would go around to houses singing and begging for food and drinks, threatening to throw rocks through the windows of anyone who refused to give them a handout. This type of drunken revelry got so out of hand that Christmas was banned from celebration for years in America in the 16th and 17th centuries. Those same ancient winter-solstice celebrations, usually lasting 12 days, gave rise to the tradition of burning a yule log, often mentioned in classic Christmas songs. People would try to find the biggest log possible to burn in a fireplace, to keep the light and warmth going during the 12 days of the feast. But what about other holiday traditions we practice, like putting a shedding tree in our living rooms each season and hanging stockings on the chimney with care? In that single poem, Moore gave us our modern-day version of Santa Claus, stockings and reindeer. Some of the most cherished Christmas traditions we still live by and follow today. He changed it all. From 1823 forward was when Christmas as we know it began. All of the traditions from different cultures — Jewish, Christian, Scandinavian celebrations — all came together at that point. Although variations of the Christmas tree had been around since the 16th century, dragging an evergreen into our homes became a modern mainstay in 1848 after a magazine in London published a photograph of Prince Albert and Queen Victoria posing in front of a decked-out fir. People in Britain went crazy for the photo and started putting up Christmas trees in their homes. Later, an American magazine copied and altered the image of the royal family to look like an American family, popularizing the trend around the United States. Lastly, the origins of Santa’s most famous reindeer, Rudolph, go back to 1939, to a Montgomery Ward department store in Chicago. That’s when an employee by the name of Robert L. May created the lovable red-nosed sidekick in an effort to promote a Christmas coloring book being sold by Montgomery Ward. Clement Moore had hinted at reindeer in ‘Night Before Christmas,’ and May’s idea of Rudolph took it even further. Now, off you go to hang those stockings, decorate that Christmas tree, buy overpriced presents, sing “Rudolph the Red-Nosed Reindeer” to strangers and wait for Santa. And drink and be merry, of course. Anyone who thinks we are making headway in Afghanistan, or thinks that the work there is a noble cause, you need to read this article from the Dailykos. Our brave young men and women are laying their lives on the line, and we’re bleeding our treasury dry for this kind of foolishness. 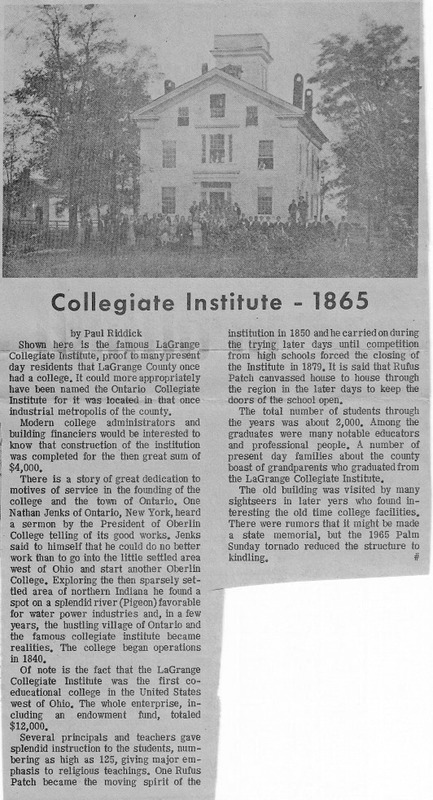 I ran onto this newspaper clipping about the LaGrange Collegiate Institute which I posted about a few days ago. I thought it might be of interest to anyone who had read the earlier posting. I was all comfy in my sweats this morning, and sat down in front of the fireplace to log on with the laptop. Well, as far as that goes, it worked out to that point. But as soon as I woke the Windows 7 system up from its sleep mode, it hit me with various necessary update messages, then the anti-virus/anti-spyware program popped up that it needed to download the newest version in order to protect my computer and its data. Now more than an hour later, my laptop is all nice and cozy in front of the fireplace, two reboots later, having its hard drive scanned by the anti-virus software, looking for infections, while I have retired to the nether regions of the house to get some work done with my trusty old Mac. This is all too often the story. Boot up the Windows machine and wait for this fix or that, that scan or this one, while the Mac just does its job. No spyware issues. No virus issues. No waiting on endless updates. No reboots. No hour or more of scanning hard drives, files, etc. Just chugging away, doing its job, no fuss, no muss.